You should have seen this one coming a mile away! Those of you that have been following me know two things - 1) I have a boat load of old jeans that I have been working with lately, and 2) I create an annual Easter egg from a different technique. 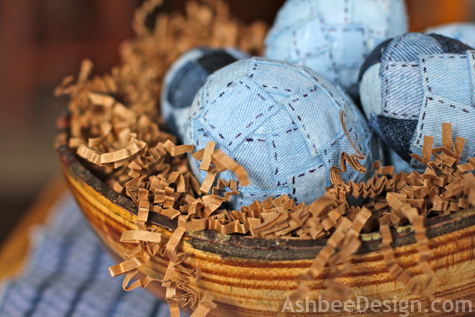 Put those two truisms together and we have Denim Patchwork Easter Eggs! Basically I cut fabric squares, used Mod Podge to adhere them to eggs, added fake stitching and made a bunch. Easy, effective and not requiring much skill at all. Anyone can do it. Give it a try because I am sharing a step-by-step tutorial below. 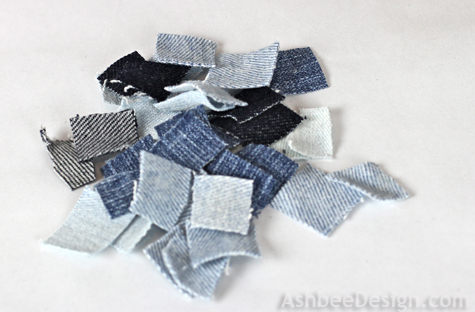 Cut the denim fabric into small squares. I found about 3/4" square was fine. I didn't bother measuring or drawing lines. This is a rustic project! I started using hand blown eggs, especially the ones with bigger blow holes but I then realized the entire thing gets covered so I might as well use plastic eggs. Blown eggs are like gold now that I seldom eat or cook with eggs. 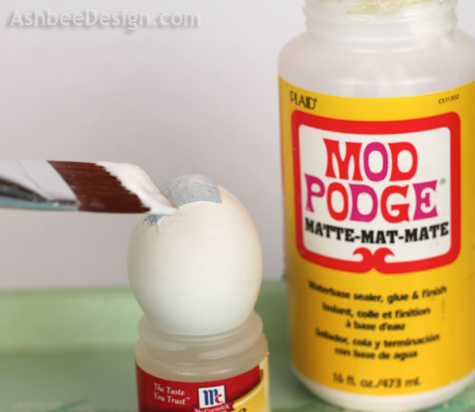 Using a paint brush, cover the top half of the egg with a generous coating of Mod Podge. Add a square of denim and cover it with more Mod Podge. Continue adding squares of denim and lots of Mod Podge. On some eggs I used all the same light colored jeans. On others I used a variety of five different shades. I like them both mixed together in the bowl. The mixture makes for a better arrangement. This is a project that allows you to have a series gong at once because you do have to wait for things to dry. 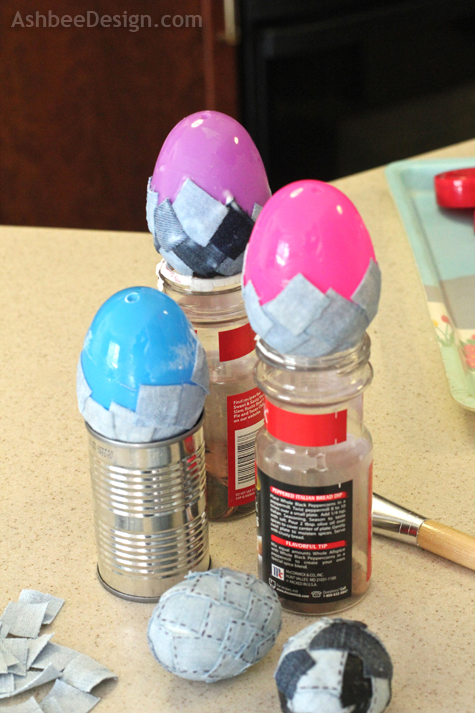 Cover the top half of the egg with overlapping squares. 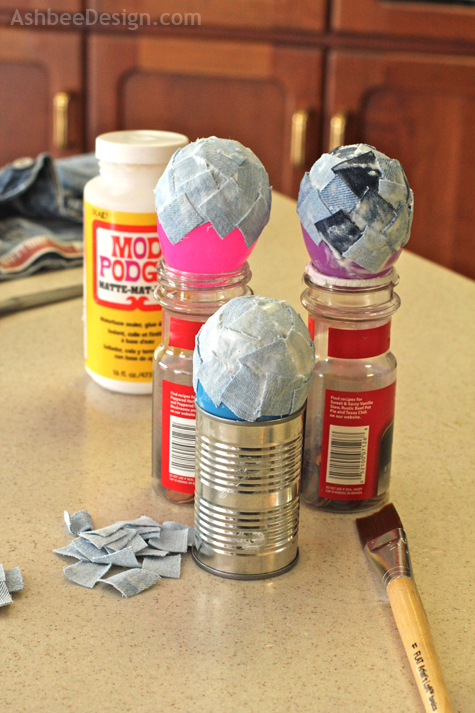 Be sure that every pice of denim is coated on both sides with Mod Podge. Also makes sure you leave no little gaps. The hot pinks will peek out if you do! Flip the eggs over and cover the other half in the same manner. Allow the eggs to dry thoroughly. I waited over night. Using a fine Sharpie Marker draw tiny "stitches" along all the visible seams of the patches. 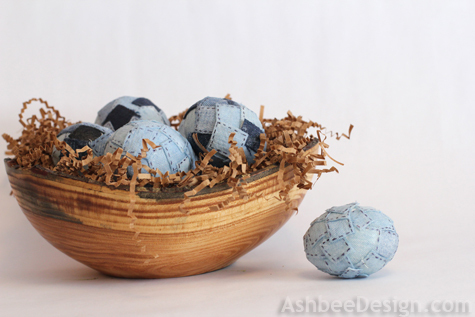 I put all of mine in a handcrafted turned wooden bowl along with some natural paper filler for "grass". 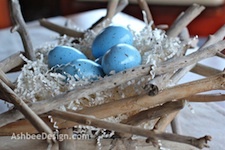 Later in the month I'll unpack my growing collection of handcrafted eggs and put together mixed bowls and baskets. These are jean-worthy! I have used denim for odd things before but never eggs. These would be cute in a basket of bandannas. I am pinning this! Love the bandana idea!!! Thanks for sharing. What a charming project! Great one for the kiddos! Yup, easy enough for the kids to be successful. Might even use old favorite clothes of theirs to make their special eggs. Thanks for visiting and commenting. Thanks. I still have to mix them in with their cousins and see how they look in the collection. Thanks for visiting and commenting. Those are tooooo cute! Pinning immediately! Just lovin' all the pinning. Love my pin boards! These are just adorable! Thank you for linking up to What We Accomplished Wednesdays. Have a great weekend! What a totally fun idea!! I was just wondering today what I could do with a pair of old jeans. Thanks for the great idea!! Good way to repurpose them. Check out the pillows I made from jeans as well. Oh these are EGG-traordinaire! Too cute! I might just make some of these to go in my dough bowl. Visiting you from Met Monday. Love the pun. Made me smile. Thanks for visiting and commenting. Wow - love this!! Especially when you added different shades of denim. Thanks for linking up at Romance on a dime! I made the plain one first then moved onto multi-colored, then back to plain. Couldn't decide which I liked better. But I do know the collection looked better with a mix, not all one or the other. Thanks for visiting and commenting. What a great idea! And I totally love the fake stitching. It really makes them look more "real". The fake stitching is what elevated this project from, yum, yuck to Oh! That is what it needed. Thanks for visiting and commenting. What an awesome idea. I love this! Brilliant and so very pretty! 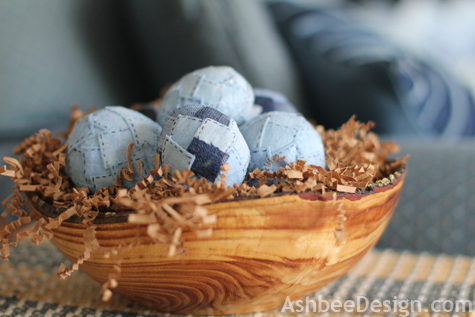 I love love using denim in our home and these would be a perfect spring addition. Oh these are gorgeous! I made pumkins for Fall, but I would have never thought about jeans! I invite you to join my link party! So pretty! 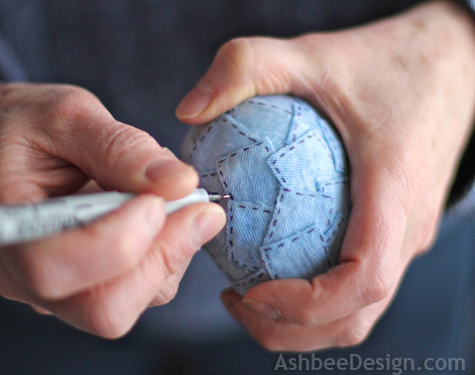 Denim Pumpkins with visible stitching. That is a GOOD idea. I can just picture it. Thanks for sharing. What a cute idea! 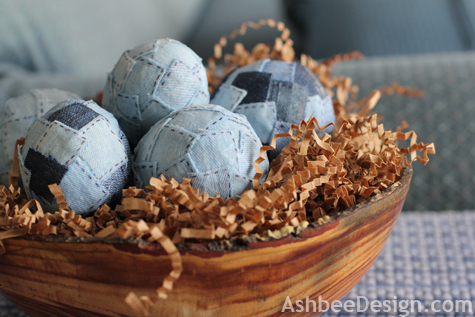 These Easter eggs look so cute, I love the denim! How fun! These are too cute!! I just pinned this. :) I'm curious what a blown out egg is though......never heard of that! A blown ou egg is one that has had the innards blown out and is hollow. 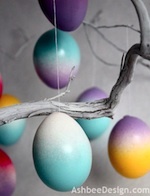 I would do it to keep eggs for decorating and be able to save them year after year. 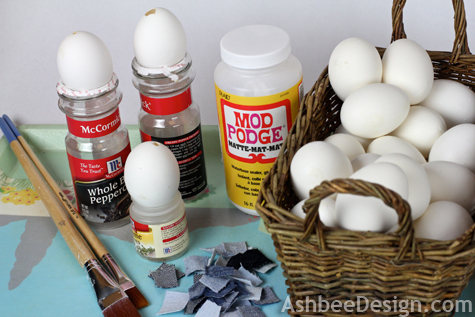 There are many ways to do it but here is a link to a post about filling the resulting holes - http://www.ashbeedesign.com/2012/03/easter-egg-prep-filling-holes.html Thanks for visiting.